How can I edit my order? This recipe servers 2-4 people. 1. Heat 2 tablespoons of the olive oil in a medium-size frying pan. 2. Add the onion and saute until translucent. 3. Add the ground beef, sprinkle lightly with salt and pepper, and cook until browned. Pour off any accumulated fat. 4. Combine 1 cup of the cornmeal, the baking soda, salt, and spices in a large bowl. 5. In a separate bowl, whisk together the milk, the remaining 1/2 cup of the olive oil, eggs, and corn. 6. Stir the liquids into the cornmeal mixture, mixing by hand just until smooth; do not over mix. Set aside. 7. Grease a large iron skillet, and warm over very low heat. 8. Sprinkle a thin layer of cornmeal on the bottom, brown slightly, and then pour in half the batter. 9. 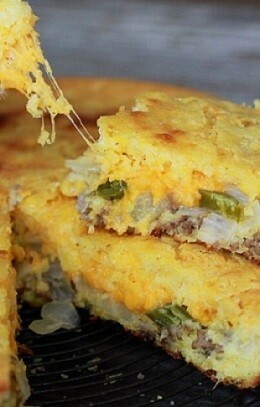 Gently spread the meat and onion mixture on top; add the cheese and jalapeno. 10. Pour the remaining batter on top. Bake for 40-50 minutes, until golden brown; a toothpick inserted in the center should come out clean. Let it cool for 3 minutes, serve immediately, and enjoy! Lamb Riblets in Mustard Rosemary Garlic Paste by Shannon Hayes.